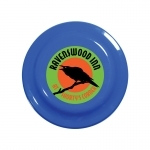 Custom Frisbees are "flying treats" for your campaign and they will take you closer to kids. Advertisers who are targeting happy faces (kids and parents) can rely on these budget-friendly promotional giveaways for kids to meet their purpose. Logo printed Frisbees make impressive promotional gifts for kids during picnics, tradeshows, business conventions, barbecue events and more. You can use these flying toys to add interest to party favor bags and promotional goodie bags, too. Order these Frisbees at guaranteed lower prices and save on investment. Fast shipping offered within the contiguous USA. 100% customer satisfaction guaranteed. It is not a bird or a plane. It is a customized flyer toy that will make your brand logo dearer to kids and adults alike. At Promo4kids.com, we offer imprinted Frisbees in various sizes and shapes that will catapult your brand logo to new heights. You can build a brand goodwill by giving away logo printed promotional Frisbees to kids or their parents during the next tradeshow, business convention or sports event. Customized Frisbees will not only boost your brand credibility but also encourage kids to come out and strengthen their relationships with their friends. There are few promotional items in the world that will offer fun, purpose and excitement as these personalized Frisbees. 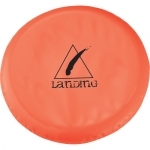 Do you know these Frisbees and flyers will offer you several benefits at one time? Colorful flyers and Frisbees is a common sight at various US state parks, beaches and holiday spots on Sundays and during holidays. So your brand name will easily get into mid air action over these customized flyers and Frisbees. In short, logo printed Frisbees and flyers will make impressive summer giveaways because people venture out during this time. Your brand logo will get popular among kids and their folks who love to have a good time outdoors. If your company is considering an outdoor event or get together this summer or other any other time of the year, consider offering these customized Frisbees. All our Frisbees bear a unique printing so that your brand logo receives easy attention whenever a kid or an adult throws them in the air. Crafted from high quality, durable and crack-free materials, you can remain assured about their ability to remain stiff against the competition. 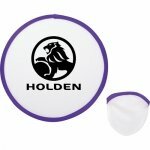 You can easily use the large imprint area offered over these allergen-free Frisbees to position your brand logo. Call us at 855-454-3786 to know the best positioning and imprint method for your brand logo. Our graphic experts will help you to design your brand logo from scratch and present it with flair over these customized flyers. To get more information about promotional giveaways for kids, email us at info@promo4kids.com.